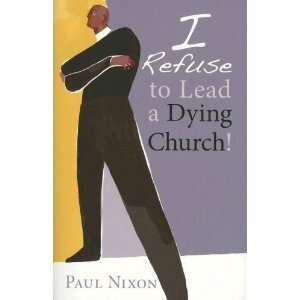 About four years ago, I discovered this little book by Paul Nixon called I Refuse to Lead a Dying Church. There was something about the cover or title that seemed somewhat arrogant to me, so at first I didn’t want to read the book and kept putting it off. When I did finally get to it, I was excited and wanted everyone to read it! I was therefore delighted to see this blog in achurchforstarvingartists and the comments it recieved, both agreeing and disagreeing. So, to paraphrase the blunt style of the author, Read this blog, then read this book, and lets get moving! Ouch! No doubt it hurt. There is certainly more than one way for a congregation to be alive and about its mission. This book can be a thought provoker and a good starting place for an important conversation. Enjoy!